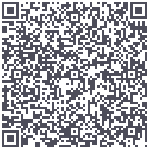 QR code (Quick Response Code) is a type of matrix barcode and it is used to display text to the user. Users with a smart phone equipped with the correct reader application can scan the image of the QR code to provide quick and effortless access to our contact information. Software for scanning and processing QR codes is available for multiple platforms, with free and paid options. Applications can be downloaded from app stores like Apple's App Store and Google Play for Android.